19.02.2010: Updated the post with a code example for setting this drop downs as required (requested by Larry). You find the code at the bottom of the article. 28.12.2009: Updated to add support for an optional delimiter character. I have also updated the functionality so that the selection now is moved from the drop down to the “Accumulated selection” when selected (and back when removed from the selection). This article demonstrates a solution for accumulating single choice selections from a drop down to a hidden multi-line text-field. The sourcecode for the file “AccumulateSelectionsToMultilineText.js” is found below. Add the columns to your list like the picture below. I have two Choice columns with some random choices and a multi-line plain text column to accumulate the selections in. The default selection must be blank to be able to select the “first value” and accumulate it as the function triggers on change event on the Choice columns. Note: The 28.12.2009-update now moves the selection from the dropdown and to the “Accumulated selections”. * Call from CEWP BELOW the list form in NewForm.aspx or EditForm.aspx with the code provided in the blog post. Save the file as “AccumulateSelectionsToMultilineText.js” and upload to the document library or folder as described above. Open the file “AccumulateSelectionsToMultilineText.js” and remove the function PreSaveAction(). Then you add this modified PreSaveAction(), and the lines for setting the red “required field” star after the label to the CEWP code. You can NOT set the field as requires under list settings. Please ask if something is not clear to you. Hi Alexander, this seems to be a really nice AddOn to whats now are missing for a single Choice column, ok you can use multiple when you are do a looup, but that will be stored separated with ; – not always what we want, for example if you later on will creating views with grouping and sorting. But, i have no luck with your script, i think i have do this exact like your description, but get this ‘unexpected error’. Have uploaded the scripts to a library and the realtive URL should be ok.
Btw, i have a custom list with this four columns and the original Titel. I have also turned on ‘Content Types’ to be abel to hide away the textboxes. I have no default value for the two Choice columns, and yes they have the same name as in the script. I also have the latest 1.3.2 min. I would be so happy if you can check this out! Hi again, i got this working now. Noticed that i had to have the reference to the AccumulateSelectionsToMultilineText.js below the Formview to get it work (and of course the array and call), nice work Alexander, good function and a little bonus for the cool fadeout when deleting! I will sure have use to this one in the future. I have not implemented this yet but looks very promising. I can see easily how I can incorporate this script and the hide/show script, getting me closer to the select a region, populate countries in that region, click a country and append a text field. I think that function would work cleaner with the cascading dropdown, but thats a little more advanced for me. So why did you use the multiple line field to append? Can it be switched to single line, or would that require code rewrite? This is some great work! thank you for putting up with me. I got to install your script, and it is brillant. I am having a issue. When I click ok to save the item my selections are removed and the fields are left blank. Your instructions are very clear, even when through them twice, which means I’m missing something simple, :). Yes, it can work fine with cascading dropdowns as well, just tried this together with SPservices at codplex, as you may have to modified in order to get an empty dropdown when the page loads. Hi, yes i was struggle with that at the first.. but now it works just fine, thanks again for this nice JS solution for this, keep on Alexander! You can use a single line text-field, but then you are restricted to 255 characters max. Regarding the disappearing selections – it is by design. The selection is written to the hidden “accumulator-field” and therefore i thought it would be best to remove the single-choice value before saving. If you want the last single-choice value to be saved in the choice-field, comment out or remove line 90 in the codeblock above. interesting out come. When I made the suggested change only the last selection displayed, no matter how many choices I made it returned the last. I place the code back in and reran, no change. the last update remained would not accept new changes. Comment out the line 44. This should show the multi-line text-field. You can comment out line 94 to prevent saving of the list form when troubleshooting. Alexander, interesting outcome. Commenting out line 44 resulted in not hiding the multiple lines, but still the same result. the options append under the choice menu but on save are lost. When I added the alert, it returned the string of options selected for choice, but still not saving them. Is your text-field of type Plain-Text? @Alexander, good day, I have a question for you. I am having an issue, not with your script. I have a choice field, multiple select. this field triggers a workflow. the problem is I think it will not trigger the flow for all selections if multiple items are selected. I am not using if field equals I am using if field contains. for some reason it only picks up one item. My question for you is If I switch to your script, and use the if field contains, can it read all the selections? To compare against a SharePoint multi-lookup field you must use “Eguals” as “Contains” does not work (as you figured out). “Equal” does actually work as you would think the “Contains” would do. If you go for “my solution”, you can go with “Contains” as it is a plain text-field. I have fiddled a bit with the code during the Christmas holiday’s. I will update the code to support a “delimiter character”. The update also changes the method of adding to the selection in the way that adding an item also removes it from the dropdown. I will most likely post the updated code tonight. The code is updated. Please review and let me know if it you have some comments. I found part of the problem. I know I was lining to a list in another collection. this did work at one time. Now it is not. I added a regular choice field and multiline field, on the same page and that field works perfectly. So maybe “‘/sites/olr'” from line 9 can/cannot be used. I implemented the older version of the Accumulated script, and it is working for me again, but without you upgrades. So to identify what was lost. the new version could not pull source from external list in another collection. I do love the improvements in the new version. This has to do with the “val” of the generated dropdown is “/sites/olr/Lists/GKSource/DispForm.aspx?ID=3”. The script is setup to read the “val” and not the “text”. For a standard drop down the “val” equals the “text”. 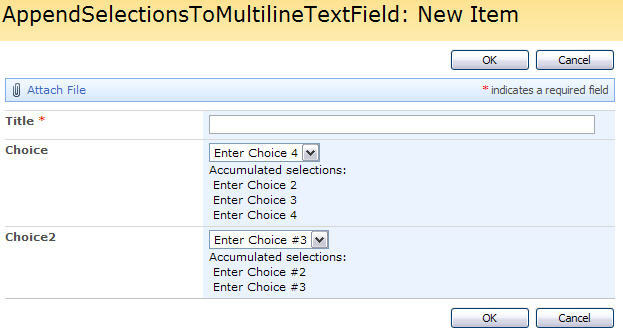 Try to adapt the script to use “text” in stead of “val” when reading the selected value from the dropdown. Now the two script work perfect together and it did not impact the way it previously functioned. I do like this val function, but no control over the value returned. Think i posted something bout this some time back. that for another day. thanks a bunch. Here is a trick question, lol. This script uses 2 fields to get the results or a multiople select. How can this be made a required field. Cant require the choice or first field because that value is noit stored there. Cant make the multiple line or second field requied, because the value has not reached it by the onclick or OK.
what would be the best way to make this act like a required field? I really like this solution especially the click to delete item from list. I have an additional requirement and was hoping you could point me in the right direction. (or maybe publish as a new topic). I need to aggregate the content of a few fields into a single line before accumulating into a list that can contain multiple entries and be easily deleted during data entry (the source fields include Choice (drop downs) a multiline text and possibly a person/group field, I’m basically building a compact log entry) I was thinking that an “Add” button could aggregate the values and place in the accumulated list while still keeping the click to delete funtionality. 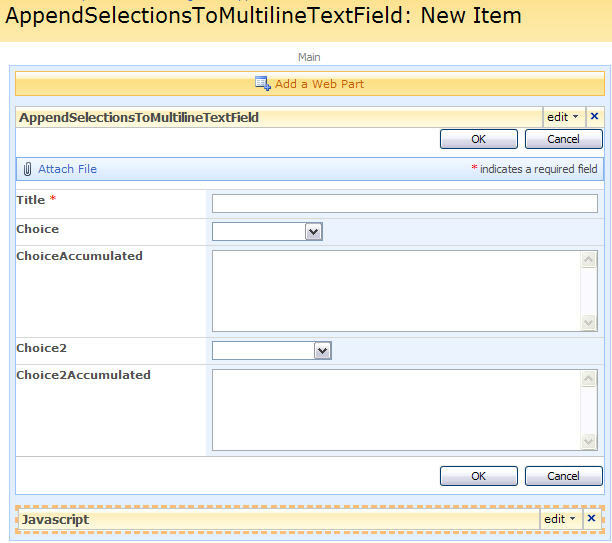 I looked at your other solution https://spjsblog.com/2009/11/12/collect-input-from-custom-input-fields-and-store-in-multiline-plain-text-field/ but that doesn’t support multiline or person fields and doesn’t have the delete feature. Any chance of this being updated? I actually have a use for this in SP2010. I took a quick look at the code and cannot see any obvious reasons to why this should not work. Have you tested it? You might want to change the “fields = init_fields();” to use “init_fields_v2();” from spjs-utility.js. I did not try it but will give it a whirl today.